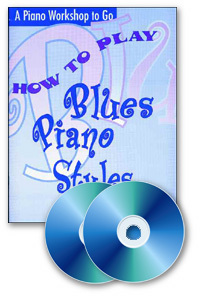 The Blues Scale is the best starting place to learn about the blues. There are 6 notes in the Blues Scale. To figure out the Blues scale, you first need to know the major scale in a key. Let's take a C Major scale. There are 8 notes in a major scale. The first note and the last note are the same. These 8 notes in the scale are called "degrees". The first degree of a C Major scale is C, the second degree is D, the third is E, the fourth is F, the fifth is G, the sixth is A, the seventh is B and the eighth is C again. This then translates to C-Eb-F-Gb-G-Bb-C.
That is the blues scale in the key of C or the C Blues Scale. Doesn't that sound cool? This provides the whole basis for improvising when you are ready to do that! Now see if you can do this on your own. Let's try to find the G Blues Scale. You need to start with the Major Scale. Now let's put our Blues "formula" on top of this scale to change it. There are lots of different ways to play a chord. These are called "voicings". Depending on the style of music you want to play in, you will pick different parts of the chord to play and even add new notes to the chord. To play in a blues/jazz style, I recommend you try this voicing. Now let's take a C7 chord as an example. The four notes in a C7 are C E G Bb. It is a dominant seventh chord. To play our voicing of 3 b7 9, we need to play E first with the pinky of the left hand. Then play the Bb with your second finger. Now what is the 9th you are wondering? This is the money note. It adds some dissonance or tension to the chord. The ninth is one whole step above the root of the chord. One whole step above the root (C) is D. So the thumb in your left hand would play D.
Now go ahead and try this voicing on other Dominant Seventh Chords like D7, G7, and E7. You will see these chords constantly in music and this voicing will really enhance the sound you get when you play them! Now here is acclaimed jazz pianist/composer, Tim Ray, with a blues improvisation lesson.